Boring white walls are a thing of the past in these next five hotels, because the more decked-out they are, the more they attract art lovers from around the world. But you don’t have to be an aficionado to appreciate the designer’s ability to make them stand out. Art comes in all shapes, sizes and colors, and in the following hotels it is hip, peaceful and provides extraordinary backdrops for unwinding and kicking up your feet up. 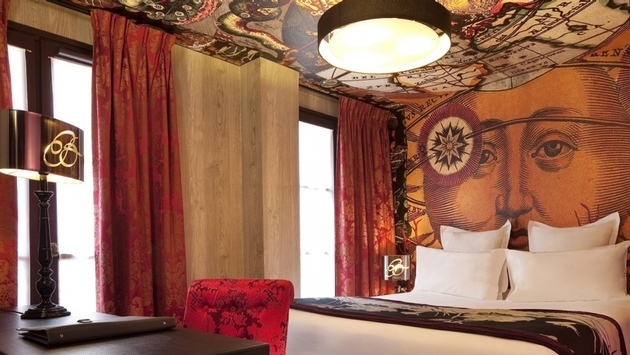 Reserving a room in the Hotel Le Bellechasse guarantees that guests never have to look very far to see Paris flex every artsy bone in its body since artistic genius Christian Lacroix is responsible for the boutique’s lavish design. Here, it seems the bolder the better, since Hotel Le Bellechasse’s walls are consumed by vibrant images that blend every type of pattern and color imaginable. Even enjoying the buffet in the breakfast room is a treat for the eyes. With a location set in the artistic heart of Beijing, it is no wonder why the city’s creative side has rubbed off on the Yi House Art Hotel 798. Just a simple glance in its direction is determined to bathe guests in the glitz and glamor that encompasses the entire property. Especially in the Grace Suite, which the hotel has dubbed the “queens of suites,” where stylish luxury pushes the envelope. Along with bathrooms dressed in white marble, its walls resemble an exhibition by the manner in which they showered in Chinese-style art. There is no question that Positano pulls at the heart strings of every type of art lover. That’s because not only does it make a bold artistic statement with bright pieces flowing from room -to- room, the hotel boasts an art gallery that is filled with various artworks that include timeless sketches, sculptures and ceramic masterpieces of local artists like Alfonso Mangone and Laura Libera Lupo. And with a setting that offers impressive views of the Mediterranean, Positano Art Hotel easily distinguishes itself from its conventional counterparts, specifically among tourists seeking artistic inspiration. The lobby of the ME London alone flaunts a cutting-edge design with spiral cushioned white couches, pitch-black countertops and futuristic lit walls. Blending the culture of The Strand, London’s artistic center, and a contemporary style that is accentuated by the city’s monumental skyscrapers, the hotel is a peaceful alternative to capturing London’s edgier side. And with rooms called Aura, Vibe, and Mode how could guests not bask in the simplicities produced by its innovative appearance? Graffiti is no stranger to New York City, but when a graffiti collage is incorporated into the sleek structure of a hotel, something unique yet beautiful transpires. The art of the streets inspired Michael Anderson when he used his collection of 4,000 graffiti stickers to decorate the lobby wall of the Ace Hotel. Besides the mural, each room is pays homage to art including the gallery, which is the result of bringing fashion, literature, music as well as other genres together under one roof.